On April 19, YouTuber Geoff Thew, best known for his videos on anime, manga and related video games, put out a call on Twitter asking for help from any fans who spoke Portuguese. About 30 minutes later, he posted a second tweet accusing Brazilian YouTuber Satty (given name Mariana Delveccio) of ripping off one of his videos. According to Thew, Delveccio used the same jokes, same analogies and other material but translating it into Portuguese. So a youtuber with more subscribers than me, @_satty, has BLATANTLY ripped off my Harem Anime PSA. Same jokes, same analogies, same order (right down to the clenched fists joke) – she even ripped off my thumbnail. At the time, Delveccio’s channel Pense Geek had a larger YouTube channel than Thew’s. She had some 624,000 subscribers compared to Thew’s 522,000. However, as Thew’s fans began to dig into the issue, they found more and more instances of plagiarism, not just of Thew’s work, but other YouTubers. Delveccio attempted to respond but, often times her response made things worse rather than better. In one case she attempted to point to a forum post with as a common source between the videos but the post came after the video she was accused of plagiarizing from. Delveccio also published a response video but the video was quickly removed as did many of the videos she’s accused of plagiarizing. On the 23rd, she filed a Digital Millennium Copyright Act takedown notice on a video comparing her work to Thew’s, further outraging the community. The story came to something of a head when Thew published a video entitled “A Huge Brazilian YouTuber STOLE My Videos” (thumbnail above). 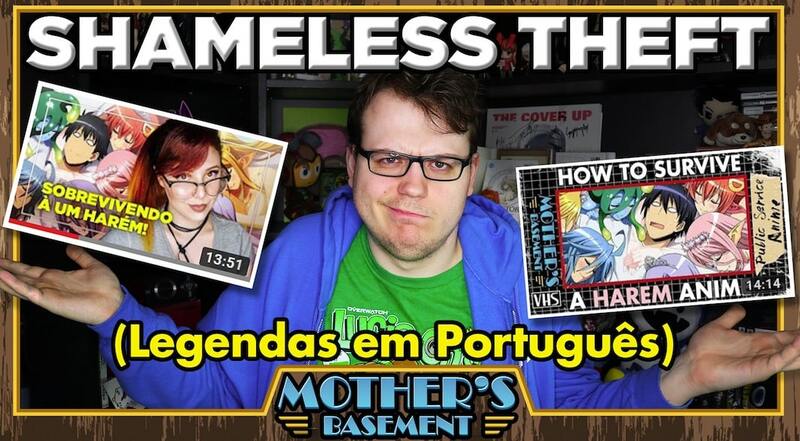 There, Thew played clips from his videos side by side with Delveccio’s (with English subtitles) and it became abundantly clear that Delveccio was reusing significant portions Thew’s videos by translating it into Portuguese and making minor modifications. As the backlash grew, Delveccio went silent. She removed all of the videos from her YouTube channel, made her Facebook page inaccessible, removed her Twitter and made her Instagram private. As such, the case seems to be over for now but it points to a much larger problem for the video sharing site. To put it simply, YouTube has a plagiarism problem and its one that both the site and its creators seem to be ill equipped to handle. Thew’s story, as much attention as it got, is far from unique. In March 2017 IGN Brazil was accused of plagiarizing the YouTube channel Writing on Games. According to the allegations, IGN Brazil simply translated the video nearly word-for-word in creating their video on Legend of Zelda: Breath of the Wild. 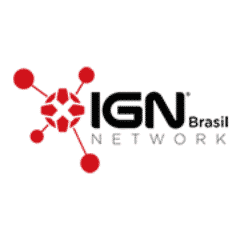 IGN Brazil removed the video in question and issued an apology, which was accepted by the Writing on Games’ creator, Hamish Black. However, the problem isn’t limited to Brazil or even translated plagiarism. In July 2017, YouTube hbomberguy posted a video about how a LukiePoo did a strikingly similar rant on the game Demon’s Souls to his own. Though the case didn’t involve a translation, it mirrored the other two in that it was not a story of outright video theft, but the reuse of research, jokes and ideas to create a new but nearly identical video. But video theft is an issue to. Earlier this month YouTuber Eric Kotzian posted a video about another YouTuber, Mateus Hwang. Kotzian’s channel specializes in piano covers of popular songs but he accuses Hwang of taking clips and audio from his videos and stitching them together to make it appear Hwang is playing the songs. Once again, Hwang runs a much larger YouTube Channel, with 732,000 subscribers to Kotzian’s 39,000. While these are easy to dismiss as isolated incidents, plagiarism that is discovered is usually overshadowed by the plagiarism that’s missed. That’s especially true when you’re dealing with non-textual and/or translated plagiarism that requires a human to spot the similarities. It seems certain that YouTube has a plagiarism problem, but it’s not one it’s really in a position to deal with. YouTube had a piracy problem almost from day one. When Google purchased YouTube in 2006, the site was known for being a haven for pirated content, even being compared to Napster. One of the first actions YouTube took was launching Content ID, a system to automatically detect and take action on duplicated videos. While Content ID h as been far from perfect, it has drastically reduced the amount of pirated content available on the service. This has not only paved the way for YouTube to offer legitimate access to that same content, often via rental, but to a wide variety of creators who no longer have to compete with a deluge of pirated TV and movie clips. But, while the piracy problem is still far from solved, especially when it comes to streaming, becoming a haven for original creators has also made it a target for plagiarism. While any marketplace for original work will become a target for plagiarists, YouTube is a very special case for a variety of reasons. First is that YouTube is a mammoth site but it is not a singular community. 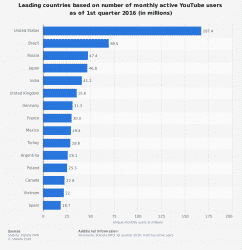 While the U.S. is by far the largest country for YouTube, Brazil, Russia, Japan, India, the UK, Germany and France all have over 30 million active users (as of 2016). This means that YouTube is not a single mammoth community but a group of (still very large) communities with different languages and cultures. As we’ve seen in Thew’s case, those communities despite existing on the same site, do not have significant overlap and YouTube’s algorithm may be helping to keep them apart by only suggesting videos in their native language. However, other YouTube decisions may be playing an equally large part of the problem. Ad revenue on YouTube has been declining for many Youtubers, as noted by the “Adpocalypse” of 2017 and YouTube’s demonetization of smaller channels. This has put pressure on creators to put out more and more content, especially long-form content, just to keep pace. Unfortunately, creating quality video content is a very time-consuming task. Researching, writing, recording and editing takes a long time, even on very basic videos and for solo creators there isn’t much way to speed up the process without reducing quality. This is where plagiarism sometimes comes in. By using content from another video you can skip much of the research and writing part and go straight into recording and editing. YouTube is large enough that the chance of getting caught is fairly low, especially if you choose videos in another language. This creates a problem, if YouTube wants to remain a bastion of originality, it has to head this problem off. However, the site and the community are, as of right now, ill-equipped for the fight it has on its hands. YouTube’s entire abuse system is designed to address issues of copyright and piracy. While it does a reasonably good job of keeping movies, video games and TV shows off the site without permission, it can’t deal with this. Upload a copy of the latest blockbuster film to YouTube, it will probably be quickly flagged and removed. Take someone else’s script, rewrite/translate it and upload a new video that’s almost the same, YouTube will see it as wholly original because the sounds and visuals are different. The tools that YouTube has built for dealing with copyright infringement don’t help here. They can’t protect against this kind of plagiarism. To make things worse, other automated steps, such as using automated transcription and translation to detect plagiarism, likely won’t work as well. Translated plagiarism is a notoriously difficult thing to detect under the best of circumstances and the added layer of automated transcription will make it nearly impossible. But even if those copyright tools DID work, many of these cases may not be copyright infringements. After all, you can not copyright facts, just the expression of them, and its very possible to plagiarize a video thoroughly and not commit copyright infringement. The reason is that plagiarism and copyright are very different things and it’s very easy to clearly and wholly plagiarize someone without infringing their copyright. In short, YouTube’s war against piracy has done nothing to prepare it for this fight and, unfortunately, it’s probably going to get a lot worse before it starts to get better. At the end of the day, this is probably low down on the issues many YouTube creators need to worry about. Freebooting on Facebook, Content ID issues and demonetization issues are probably much more at the forefront of the average YouTuber’s mind. However, what’s interesting in the cases above is that, often times, the plagiarist was much larger than their victim in terms of channel popularity. Plagiarism on YouTube isn’t just an unethical shortcut, but a strategy for success. If YouTube and the YouTube community doesn’t want this to become a new normal, they have to push back now. YouTube can make this more clearly against their terms of service and the community can do what they doing, targeting and stopping these plagiarists. Plagiarism, in a community is like a virus. Once it starts to take over, it’s nearly impossible to fight back against. Plagiarism kills creative communities and, even if it doesn’t appear to be a major issue for the average YouTuber today, it could become a much larger one for YouTube as a whole.